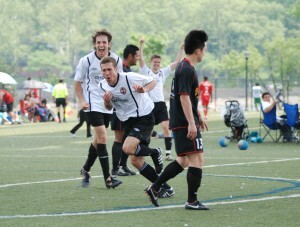 The 1sts are in the League Cup Final this Sunday against Hoboken FC Reserves, 4pm at Icahn Stadium. 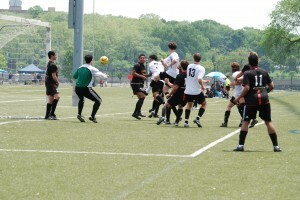 The Mens White Reserves beat Mineola (LISFL) 5-1 to advance to the D’Arpino State Cup Final. The White Reserves lost a tough one last night at Maycomb’s Dam Park next to Yankee Stadium against NYAC. Much of the first half was played in monsoon conditions, and about 10 minutes in, after an blatant missed call by the referee, NYAC converted on a slippery corner to go up 1-0. From that point on the match was a battle. CPR probably held a bit more of the possession, but neither team created any true chances. CPR was in command of the second half for the first 30 minutes. Holding possession and probing for an opening in the NYAC defense. The White Reserves best chance came on a cross to the back post by Archie that was headed down by Mike D. forcing the keeper into a difficult save. As time grew short CPR pushed numbers forward, but unfortunately found themselves short at the back for two quick counter attacks that dashed CPR’s hopes of repeating as league champions for a 3rd consecutive season. NYAC added a few more due to defensive errors and low numbers at the back for the final score of 5-0. The White Reserves look forward to playing Mineola Portuguese Sunday on Randall’s Island at noon in the State Cup Semi Final. The white-jerseyed women’s team proved again that they are the most fun-loving team in the league. For 70 minutes, the ladies kept the game interesting by giving their opponents a few dangerous chances and not capitalizing on their own offensive opportunities. And then, Al got another breakaway, this time off a pass from Dufton. Al beat one defender and the goalie, and the Whites were up 1-0. As mentioned, though: this team just loves fun. And, well, it wouldn’t be fun for the Kickers not to score too. So the game ended in a 1-1 tie. To continue the fun, Kelly(y) hosted an end-of-season dinner at her rap-star-fabulous apartment, and the women watched the sun set from a Gramercy roof-top hot tub. No glass allowed. 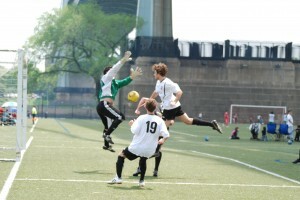 Central Park Rangers White and NY Magic Reserves faced off at 11am on Sunday April 29th at the East 6th Street field. For a better part of the first half, both teams appeared evenly matched. That balance tipped as the half began to wrap up and the Magic mounted a more threatening offensive attack. The Magic were able to capitalize on this and the score was 1-0 at the half. During the second half, the Magic’s offensive surge continued and they scored twice more in the second half. Before the Magic scored their final goal, CPR White had a nice run to goal and got a solid shot off that bounced right on the line giving their goalie a chance to recover, collect the ball and stop CPR’s chances for a rebound. Similarly, the Magic’s last goal landed right on CPR’s goal line but the CPR was not able to recover and the referee determined the ball was crossed the line. 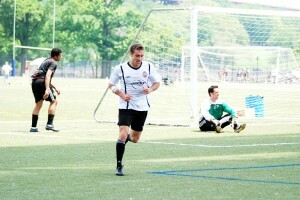 The final score was 4-0 in favor of the NY Magic Reserves. 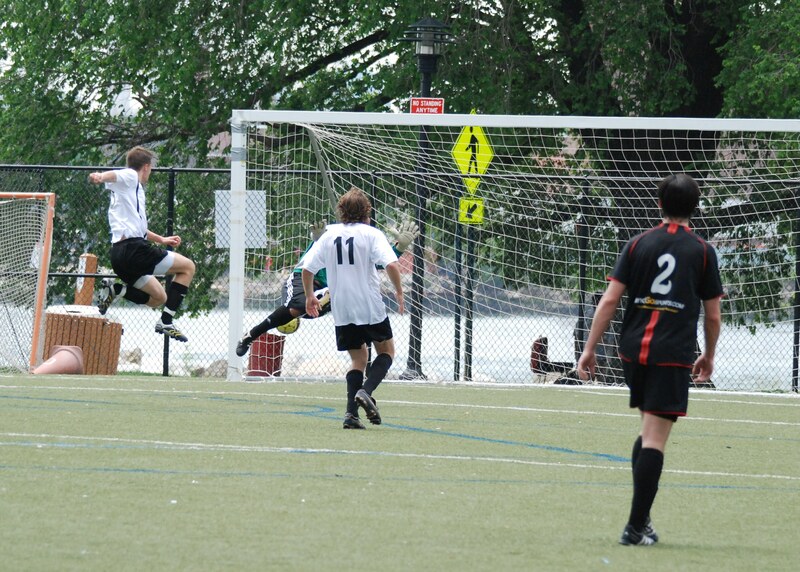 The Mens White Reserves have a playoff game tonight, 8pm at Macombs Dam Park, right next to Yankee Stadium. 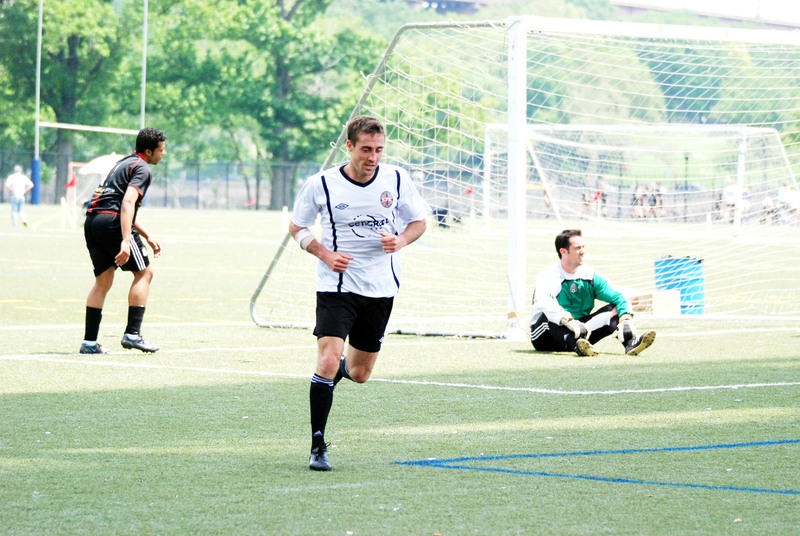 The White reserves put on an impressive showing Sunday at McCarren Park against Floral Park in the State Cup Quarter-Final. From the first whistle CPR was in control. Having almost all of the possession, and dealing with a low pressure Floral Park defense, the Reserves found it rather easy to move the ball around. The most dangerous chance came as Muzza got on the end of a through ball, cut in behind the Floral Park back line and lashed a shot that forced a full stretch save from the keeper. Despite many more opportunities CPR could not break the dead lock before half time. The only danger posed to the CPR back line came off of rare, but somewhat nerve wracking counter attacks by Floral Park. The second half opened on a much higher note for CPR, as a ball played into Sol’s feet in the box was brilliantly flicked into Norelli’s path, who smashed it home over the keeper’s right shoulder to take the lead. Norelli’s second tally came a few brief moments later as he found himself with no angle on the end line, but with some explosion of skill managed to sneak the ball between the keeper and the near post. Floral park managed to scrape one back about ten minutes later as a bouncing ball about 30 yards out was met with a wonder half-volley by their defensive center midfielder that swerved and dipped into the upper right corner. Jon made a valiant effort, but it was virtually unsavable, a once in a lifetime strike. Riso brought the game back to a comfortable level when he was upended after a slicing run resulting in a penalty, which he calmly tucked in the lower left. From there on it was all CPR with chance after chance as Floral Park lost hope, desire, and energy. Andres netted his first goal after coming back from his knee injury to make the final score 4-1. 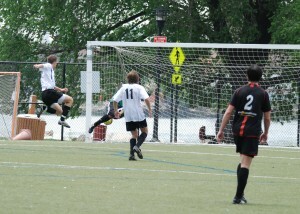 The White Reserves play NYAC in the League Semi-Final Thursday May 24th next to Yankee Stadium at 8pm. The State Cup Semi-Final will be played Sunday May 27th on Randall’s Island against Mineola Portuguese at noon. Subs: Jacapo, Joakim, Mike N.
We finished our regular league schedule on Sunday with a tough loss to the Greek Americans reserves. The whites reserves went up early when the Greeks’ keep failed to clear a CPR corner and big man Nick Rudd composed himself to smash the ball into the open net. But the Rangers’ lead would not last. Late in the first half, the referee gave a questionable-at-best penalty, which the Greeks’ shooter failed to convert on his first chance. The ref called it back, citing confusion over the whistle and on the second attempt the Greeks converted, leveling the score 1-1. In the second half, a lapse in concentration on a Greek direct kick just outside the box resulted in a second goal, and CPR went down 2-1. The nail on the coffin was driven home when a mix up at the back saw CPR’s goal scorer inadvertently turn one in on his own net. Despite the lack of luck, CPR continued to work and succeeded in pulling one back when Archie squared the ball across the goal for Dan Riso to finish off some intricate passing around the box. Unfortunately, the 3rd goal wouldn’t come. The firsts played a mostly reserve team squad of Polonia…. but then we too had to have a lot of help from our reserve players, some of who put in a double shift from the previous game. Still, similarly to the earlier game, we could not turn dominance into goals, missing chance after chance until Eli hit a great strike from distance which cannoned down from the bar for Lasse to poke home to take a first half lead. As the Poles tired in the second half the goals started to come, with Kwesi (a superb hit into the top corner), Dan B (first CPR goal), Norelli and Eli completing a 5-0 demolition.